After attending Jackson's talk downtown, we went for dim sum in Chinatown! To celebrate Jackson passing his prelim he went bowling at Sacco's Bowl Heaven. Skating on Frog Pond, Hot Chocolate and dinner downtown Boston! What a success! Today we raised over $330 for breast cancer research. All the members of the lab baked goods that we sold at Tufts. All the proceeds go the American Society Making Strides Against Breast Cancer walk, which we are participating in at the end of the month. Thanks to all of those who came today! We had a great time at our first summer BBQ organized with the Gertler and Burge labs from MIT. Lots of grilling, sangria, mojitos, veggies and a corn hole tournament! Congrats to Jackson and Will for winning the title, and Annika, Gabrielle and Lily for cheering them on! First point hike with the Timko lab, which opened a year before we did here in the BME department at Tufts. We hiked Mt Monadnock and had a great time. What one should we do next year? Every year, the different graduate programs the Sackler School of Biomedical Sciences compete in the Sackler relays. Running, dodgeball, tug of war, volleyball... we did it all! We had a delicious pot luck lunch where everyone brought a dish from their home country, and then headed to Boda Borg Boston for some quest! Proud to say we solved 3 quests- almost 4!! Great team work! What a great time catching up with colleagues in DC, and learning about new advances in cancer research. Madeleine and former student Lucie Barbier, now a PhD student in the lab of Mathieu Piel at the Institut Curie in Paris, celebrate their recent publication with traditional French fare outside the Notre Dame Cathedral in Paris! Congratulations on your first publication Lucie! ​Koch Institute scientists at the Annual BMES meeting! Simone Schurle, Ester Kwon, Nil Gural, Omid Veiseh and Mike Mitchell represented the KI very well at this year's BMES meeting in Minneapolis! Signaling by Adhesion Receptors GRS/GRC! What a great time at this year's Signaling by Adhesion Receptors at Bates College in Lewiston Maine. Thanks to my GRS co-chair Nisha Mohd Rafiq for all her hard work to plan this outstanding meeting. Thanks to GRC chairs Alpha Yap and Chris Chen for organizing a wonderful GRC. So thankful for this great community! So grateful to receive the Infinite Kilometer Award from the MIT School of Science from my contributions to research and the MIT community. Thanks to my PI Frank Gertler for the nomination! 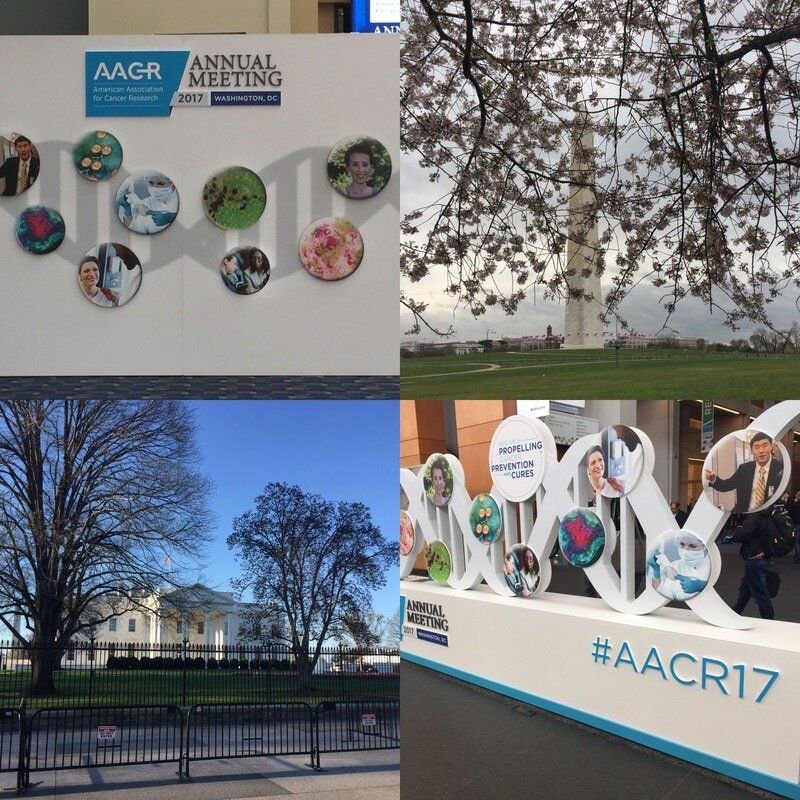 AACR Annual Meeting 2016 in New Orleans! Great to take advantages of all the local delicacies and traditions this city has to offer... while of course attending the talks!! KI event for SOLVE @MIT! Cardboard cutouts of our faculty!!! 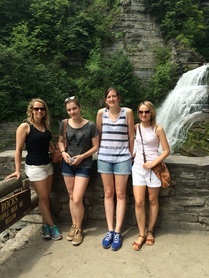 When technician Tatiana moved to Ithaca to start grad school at Cornell University, what better reason for a road trip then to come visit her and discover this beautiful area! Madeleine, Lucie and Joelle tackle the Boston skyline!